His Holiness the Je Khenpo appointed Sherub Phuntsho as Khempo of Kanglung Shedra in Trashigang, today. The 40-year-old is from Rollam village, under Yalang Gewog in Trashi Yangtse. Prior to his current appointment, he served as a teacher of Kanglung Shedra. His Holiness also appointed Lobzang Tashi, 25-year-old from Gongthung village under Yangnyer gewog in Trashigang as the Kudrung of Trashigang Rabdey. He worked as a Rabdey teacher for 2 years. 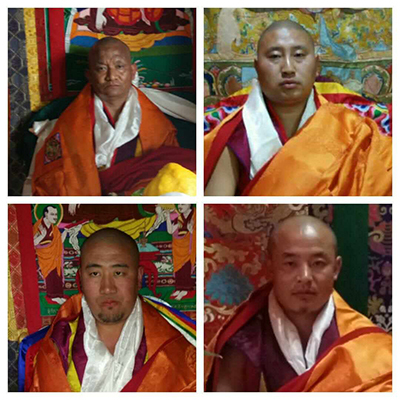 Meanwhile, in Punakha, four new Kudrungs were appointed by His Holiness’s Representative, Dorji Lopen of the Central Monastic Body, today. They are Kudu Shaa, Tshochay Kudu, Kudu Parop and Tshenye Kudu. The Kudrungs are appointed every year coinciding with the traditional day of offering. Forty two-year-old Gomchen Tshering, from Dhompala in Punakha was appointed as Kudu Shaa. Prior to his current appointment he served as Utse Goenpai Kangjup in Punthim Dratshang. Thirty two-year-old Kinely Tshering from Taba in Thimphu is the new Kudu Tshochay. He served as the Principal of Dechenphodrang Monastic School before his current appointment. Pema Tshering, 37-year-old from Haa was appointed as kudu Parop. He served as a teacher at Punthim Dratshang. Meanwhile Tshenye kudu Tandin Tshering is from Goen Nubri in Punakha. The 39-year-old was in retreat for nine years at Talo Pang Karpo in Punakha prior to the current appointment.